The Sandman Special contains two stories featuring the most obscure incarnation of the character, the 70s version, master of the Dream Dome. The first of the two, by Jurgens and Bogdanove, does a really enjoyable job of capturing the craziness of the original series. 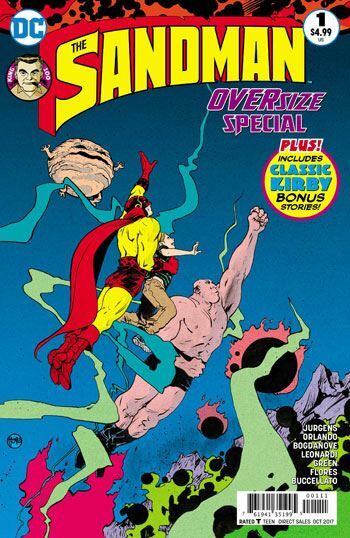 Sandman gets an alert in the Dream Dome about a terrible nightmare threatening a young boy, and releases his assistants Brute and Glob to aid him. But another mystery hero joins in the fray, helping Sandman. This story feels so much like a tale from the original book, although it has a great twist ending that those stories would never have contained. I also need to commend this story for the two page spread the uses illustrations on top of a photo montage. This was a technique that Kirby used occasionally, but in my eyes, they never seemed to work very well. Part of the reason was that they are all, in the 70s books, in black and white. Kirby would use the photomontage to convey wildly dramatic and bizarre other worldly locations, but the limited printing technology of the time meant that the reader had to envision how it might look in full colour. Bogdanove iis not held back by this constraint, and so he is free to execute a wonderful two spread that achieves what Kirby was aiming for. The second story in the issue, by Orlando, Leonardi, and Green, utilizes Sandman and his two monsters, as well as Jed Walker. Jed was the boy that Sandman aided in most of the stories from the 70s book, and was brought back by Neil Gaiman in his version of Sandman. This story, while dealing more with the 70s version, has a grown up Jed, older than the one in the Gaiman books, so it is loosely possible to harmonize it all. It’s a sadder, more emotional tale than the first one. I can’t say I enjoy it quite as much as the lead tale, but the contrast is effective. Oddly, the back-up stories, the Kirby reprints, are not of Sandman. Instead, this book reprints the Tales of the DNA Project shorts which ran in the pages of Superman’s Pal, Jimmy Olsen. The DNA Project would, in later continuity, be known as Cadmus.